Dismantling of the local landmark began on March 11th and is expected to take less than week to complete. 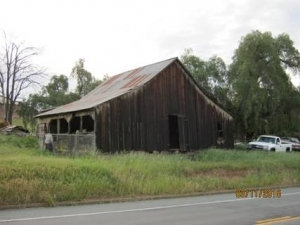 According to Robert Perry, who lives next door and sent these photos, “Rising cost of insuring the property with the barn on it was a major factor in the decision to take it down.” Perry says the barn dates back to at least 1892, according to an El Cajon Historical Society publication, though it could be older. 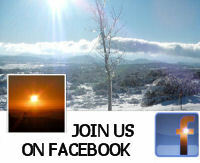 The Paul family came to America from Scotland with his family in 1892, excited to begin a new life in El Cajon. They traveled 4,000 miles by sea and 3,000 miles by land, arriving by horse and buggy at the two 20-acre orange grove’s that the family patriarch had purchased on a prior visit here. 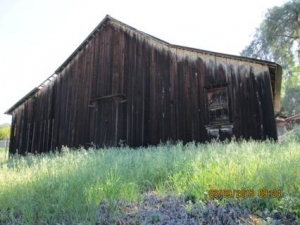 The first thing they saw upon arrival was a huge barn – the one that has remained there for all these years. The El Cajon Historical Society published a pamphlet in 1995 titled "Summers at the Paul Ranch" written by George Paul, a grandson of the barn's owner. His story describes how the family helped build a flume to bring irrigation water from Cuyamaca, and how as a young man, his father got a job in San Diego and rode his bicycle 17 miles each way. A fence was built to protect a pepper tree, which George’s grandmother kept running into with her buggy. 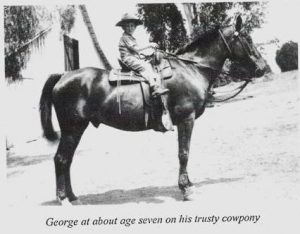 George recalled playing cowboys and Indians outside the barn in his youth, as a photo in the historical pamphlet shows. George and his brothers, Bert and John, learned how to shoot cap guns as well as bows and arrows. Agreed. As these buildings disappear, along with the open spaces around them, East County looks more and more like the heart of the city. More local history is being lost. How long will it be until houses or apartments are built on the site?